Meet The Boys: Bach, Beethoven & Brahms; they patrol the Pine Grove Cemetery in Brunswick, Maine, where I take my afternoon walk. I’m not at all sure if they’re boys (who’s to know? And, more importantly, how do you tell? ), but they’ve been hanging out together all summer. They know me now, and we’re friends. I owe that friendship to my maternal grandmother, who loved crows and taught me to love them as well. It took some time, believe me. When I first started walking in the cemetery, there was quite a ruckus – great flappings and cawings; they flew from tree to tree in the woods around the perimeter, yelling at me the entire time. But I remembered my grandmother, and so I talked back. They hollered back, a constant harassment; I was an interloper, an intruder. And so it went for a week or more. I went to our local farm and feed store and bought a bag of sunflower seeds. That same afternoon, I put a couple of handfuls into a baggie, then headed out for my walk. And this time, I took the lead. “Hey!” I shouted, when I got out of the car. “I’ve got something for you!” I shook the seeds in the bag, held it up. There was silence for just a moment, but then they cawed back. I walked along, sprinkling seeds every now and then, talking the entire time; I talked about the weather, how my writing was going, how good these sunflower seeds taste...on and on. They quieted down a little. They perched up in the trees, but they never took their eyes off me; their vocalizations shifted a bit, became calmer. When I was a safe distance down the path, they flew down from the trees, down into the grass to find the seeds. They recognize my car now; they’re often waiting for me. There are a few loud cawings when I first arrive – she’s here, she’s here! – and then softer calls. I talk, they talk back; I walk up and down those lovely rows and they walk with me – Bach, Beethoven and Brahms. 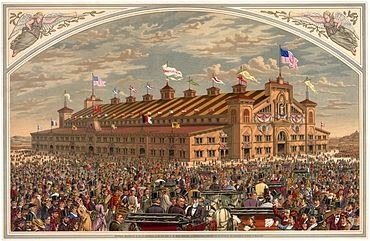 In 1872, the largest musical concert in the history of the world was held in Boston at the newly-built coliseum, which could hold 100,000 people (quite an architectural achievement for 1872, wouldn't you say?). The World Peace Jubilee and International Musical Festival, honoring the end of the Franco-Prussian War, took place in the Back Bay area of Boston, approximately where Copley Square is today, and my great-great grandfather, John Allen Gould of Walpole, was there. He saved his “official programme;” it’s been stored in his tin document box since then; this week’s Sepia Saturday prompt gave me the excuse to bring it out again. Bands from London, Paris, Berlin and Dublin performed; Johann Strauss (remember the "Waltz King?") was there, as well as his son, who directed a 2,000 member orchestra for a performance of Verdi's Il Trovatore. The United States Marine Band played. One of the most popular performances was by the Fisk University Jubilee singers -- it was the first appearance of an African-American chorus in a large musical production! Johann Strauss played the violin. The audience demanded -- and got -- an instant repeat of his new "Jubilee Waltz." It was a pretty big deal! The “programme” listed a few wonderful numbers: Rossini’s Overture from William Tell (I’ll bet those Bostonians never imagined the Lone Ranger and Tonto barreling over the plains! ); Bach’s “Commit Thy Ways;” “Let the Bright Seraphim” by Handel. There was a sextette from Lucia, performed by a “bouquet of Artists, Chorus and Orchestra.” All members of the bouquet were listed on a facing page, including two sopranos from Portland, Maine, two altos from Bangor, one Portland tenor, and a bass from Bath, just 6 miles north of my town. The great, usurping, tyrannizing, noise and pretentious thing is over, and there is a general feeling of relief, as if a heavy, brooding nightmare has been lifted from us all. Oh, well...can’t please ‘em all! I played solitaire the other day after breakfast. I sat at my dining room table and had a second cup of coffee, listened to the rain outside on the porch and played a few hands of La Belle Lucie, a favorite of my grandmother’s that we all played endlessly on rainy summer days in the house on the lake. And then, dawdling, avoiding my home office and the novel I’ve been picking at for a while, I started building a house of cards. A “house of cards” is an argument or position that falls apart easily; it looks sturdy, but it’s not. John Milton first used the expression in 1641: “Painted battlements... which want but one puff of the King’s to blow them down like a paste-board house built of court-cards.” (from Of Reformation Touching Church Discipline in England). In its simplest terms, a house of cards is just that: a structure built from playing cards, one that relies on an architectural system of layering and stacking cards, using balance and friction to attain height and stability. A classic example of this architecture is, of course, Stonehenge, where one horizontal stone was “stacked” on two vertical ones. Not cards, perhaps, but the principle is the same. Some argue that the larger the structure, the more opportunities for it to fail (all it takes is one card, after all, to cause the collapse of the whole thing); others say that the higher a house of cards stands, the more secure the foundation, since the weight of the upper cards against the lower provides stability. In 1901, an Englishwoman by the name of Victoria Maitland, established the first known record of a house of cards, a fifteen-story structure. Her achievement didn’t last long; in 1902, Rosie Farner (also English), built one of twenty stories. And in 1903, Miss F.M. Hollams (yet another Englishwoman – what’s with those English, anyway?) built a towering twenty-five story number. I cannot imagine twenty-five stories: I feel successful at two. The current world-record holder is Bryan Berg (USA), who built one more than 25 feet high in 2007. Today, “House of Cards” is many things: a movie about a woman whose husband dies in an accident at an archeological dig; a television series about a congressman who seeks revenge on all those he feels have betrayed him; a documentary about the recent financial crisis in the United States. There are several books, too – one a romantic trilogy in which each novel is subtitled for a playing card: Ace of Hearts, Jack of Clubs, Queen of Diamonds. Characters include the Earl of Carde, his son Alexander (called Ace) and another son Jonathan (Jack); I’m assuming the lost daughter is the Queen, but am not sure. Other Houses of Cards are: a political thriller; the story of an Alabama college student who becomes involved with the student movement of the 1960s and, I’ll bet, topples within the cause; another’s an expose of greed and arrogance on Wall Street; a fourth tells the story of a woman’s unsuccessful attempt to build a home...a tale that ends, as the review says, in insanity. I think I’ll stick to solitaire. The Sepia Saturday prompt nearly took my breath away; I knew exactly which photograph I wanted to post – exactly – and you can see why, can’t you? I nearly tore my house apart trying to find this photograph; I searched through boxes and desk drawers, pawed through things in my cellar, things in my garage; I poked around closets – anyplace I thought it might be stashed. It was, of course, in the very last place I looked (I think somebody famous said that, but I can’t remember who): it was inside one of those magnetic picture frames that people stick on their refrigerators. It was even on my own fridge: in the same frame – but underneath my favorite photo of my parents taken years ago. Here’s my father in the summer of 1990 at a family gathering in East Boothbay, Maine, at our old family summer house. 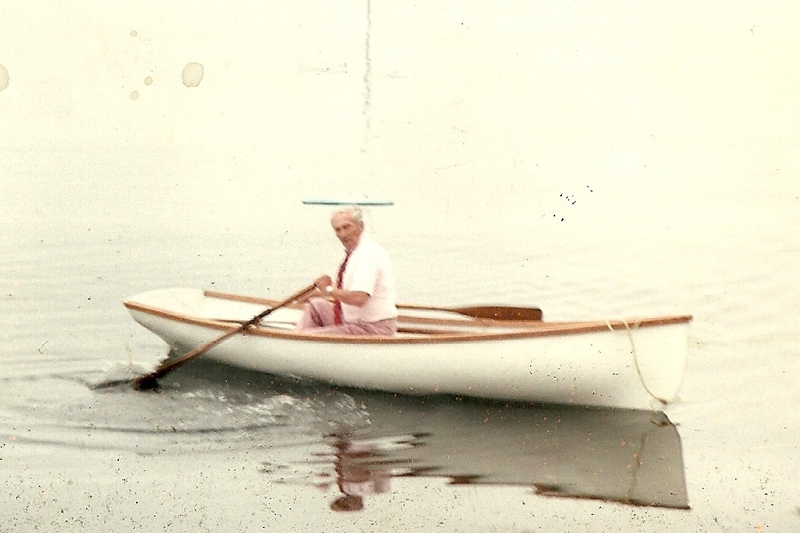 My father spent every summer of his childhood here; his mother, Nina, had an old rowboat she used every day – it was her favorite form of exercise. She also used it once a week to sink bottles, and she often took my father along to do the sinking! Remember, this was in the early 1900s, before we had recycling laws; people got rid of their trash very differently back then. They composted all their vegetable matter, burned all paper products in a barrel (with a screen over the top – remember?) and disposed of their broken pottery and glass by dumping it offshore. To make sure that bottles sank, Nina used a brass rod to poke out the bottom, then drop the bottle over the side of the boat. When Dad got old enough, she’d take him along. He was in charge of ramming the bottoms out of the bottles. When my grandmother’s first boat disintegrated, my grandfather had a second built; perhaps there was even a third, but I’m not sure about that. ...and here’s my father, floating around the cove IN Nina, remembering when he was a boy floating around WITH Nina, his mother.